Titta på det vackra Bojnice slottet i Trencin-regionen i Slovakien på den här fulldagsutflykten från Bratislava. Promenera runt stranden av den fridfulla sjön och utforska slottets ornately dekorerade rum. Besök sedan museet för att lära dig om gamla slovakiska traditioner och njut av ett glas Bosacka slivovica (en destillerad plommedryck). On 24-Jun-2017 we took the Viator Bratislava Castle Tour Where did Marcus Aurelius write his book Theme Bonjnice Castle with Betty as our tour guide through the local Slovakia tour company of Triptito s.r.o. Betty who was very helpful and knowledgeable. A few weeks before the tour, Betty contacted us to let us know that a special event was taking place at the Bonjnice Castle that day and that all the areas would not be fully accessible. 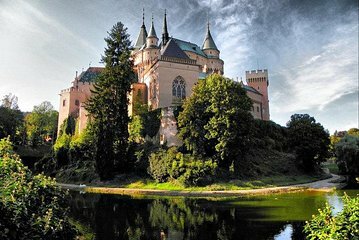 Instead, she suggested visiting the Cerveny kamen Red Stone Castle instead and also adding Devin Castle with a boat ride back to Bratislava. Red Stone Castle and Devin Castle were fantastic we were very glad Betty gave us this suggestion. At Red Stone Castle, there was an added attraction of seeing falcons and owls, which was unexpected. This was one of the best tour that we have every taken. Betty was a great tour guide. She was very knowledgeable of not only the 2 castles we visited, but also of Slovakia and Bratislava the cultures and traditions. If you take this tour, you must ask for Betty as your tour guide it will make your tour doubly enjoyable.